The results from the latest university research audit indicate that research in Australia is improving. This suggests that the Excellence in Research for Australia (ERA) exercise is working: ERA has achieved its main aim of boosting the quality of Australian research. However, this headline statement masks a plethora of concerns. The impact and engagement measures herald a new era that rewards researchers for collaborating beyond their institutions. It is timely, then, to reassess ERA’s utility. Is it fit for purpose? Will these two assessment systems complement or contradict one another? What has gone well in ERA? The ERA processes have recognised peer review alongside metrics. Research efforts at universities are arguably now more focused towards areas of strength. There is a clearer (though contested and arguably narrower) understanding of scholarly research, particularly that which is non-traditional. On paper, ERA has established a system whereby research can be compared nationally and against international benchmarks. Individual researchers are not assessed by ERA per se. However, they are assessed in line with ERA at the institutional level — in a system that awards a single score for an entire discipline cohort. Inter-disciplinary research has been disadvantaged. ERA’s 1,238 fields of research (FoR) codes make it problematic for researchers to publish outside their discipline or academic unit. Publishing, performing or exhibiting internationally is perceived to be more prestigious than in Australia. This unjustified exoticism diminishes the importance of Australian research and puts local and Australian publication outlets at risk. A lack of transparency and accountability remains a critical problem. The process by which final rankings are calculated remains opaque. It is unclear how the peer review of evaluation units is moderated and benchmarked globally. The rationale for inclusion, exclusion and change in the list of journals recognised by ERA has not been made public. Whole disciplines ranked “below world average” are reliant on empirical research to fathom what went wrong. There is no feedback other than the score. Esteem measures are narrow. The category “prestigious work of reference”, for example, is strikingly limited. It has never been opened to public discussion. Why have some publications been chosen and others omitted? The ERA journal rankings were abolished in 2011. However, their ghost influences decisions from journal selection to academic recruitment and promotion. Universities still reward publication in high-ranking journals from the list; some institutions recognise only research published in A or A* journals, or those marked “quality” in the current list. As predicted, the editorial boards of these journals are struggling to cope with the influx of submissions. Lower-ranked journals and those with lower impact factors are struggling to survive. Many Australian journals are disadvantaged by the bias towards international journals. The audit culture most affects early career academics. They and others struggle to negotiate the system, juggle heavy teaching loads and manage the precarity of casual academic employment. The international mobility of Australian academics is high and early career academics are the most likely to move overseas or leave higher education. The loss of young academics from an ageing academic workforce risks Australia’s ability to meet future demand. Moreover, it impairs capacity for innovation. Measuring engagement according to research income from industry is concerning. How, for example, will collaborative research with not-for-profits and innovative start-up companies be measured? How will the new measures account for these organisations’ exemptions from a cash contribution for Australian Research Council Linkage proposals? There is a contradiction between a new impact measure that encourages a culture of risk-taking and ERA, which promotes risk-avoidance behaviours and impacts upon academic freedom by directing research behaviour. This is particularly problematic for new researchers, blue-sky research and research with benefits that emerge only in the long term. Both systems place professional service outside academic workloads. This raises new questions. Who will edit the journals, convene the conferences, become officers of professional associations, or write the handbooks and textbooks? These activities are essential to the health of all disciplines. Increasingly, they are unrecognised and unrewarded. This has long-term ramifications for both research quality and impact. Neither system recognises investments in partner communities that are critical to social licence to operate in many disciplines. Has ERA run its course? Perhaps. It certainly needs improvement. The ERA process should be subject to external review. We need greater transparency about the criteria that inform assessment categories. We need discussion of categories not yet opened to consultation. Given concerns over gaming the system, we need an audit of data that has been excluded from ERA submissions. There should be a review of disciplinary membership of the committees in terms of institutional representation through time. We need ERA to cease peer reviews of outputs already subject to double-blind peer review. There is a dire need to review the real cost of each ERA exercise, which runs approximately every three years. We need to consider whether the costs of assessing research excellence exceed the benefits. While the ARC’s administrative and departmental costs are low, we also need to assess the costs of university compliance and of playing an effective strategic assessment game. The new impact and engagement measures redress some of ERA’s deficiencies, but the challenges of cost, transparency, audit culture and external oversight remain. And teaching remains out in the cold. Recent postings on social media of the destruction of 3,000 year-old Assyrian sculptures by ISIS highlights a new threat to cultural heritage in times of conflict. 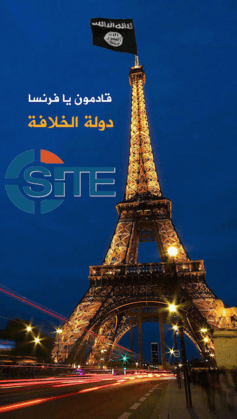 Read symbolically, these actions can be interpreted as “cultural payback” for irreverent cartoons of the prophet Mohammad as a dog or with bombs hidden in his turban, themselves likely motivation for recent killings in Copenhagen and at the offices of the satirical magazine, Charlie Hebdo in Paris. While the symbolic function of cultural icons has made them a target for destruction throughout history, recent changes in the nature of warfare and the media landscape have increased their vulnerability in times of conflict. Taken together, recent changes in the nature of conflict and in the communication environment have created a new context in which the destruction of cultural icons by one of two individuals can be a relatively low-risk choice for extremists seeking maximum impact for their political agendas. The modern communications environment provides extremist groups with the chance to garner unprecedented public attention for their cause. An increasing reliance on the global communication of extreme acts to convey a political message is apparent in videos of radical acts, such as internet videos of beheading prisoners or the multi-angled videoing of the execution of the Jordanian pilot, Muath al-Kaseasbeh. Moreover, recent transformations of the media landscape have opened up new global channels of user-led communication. 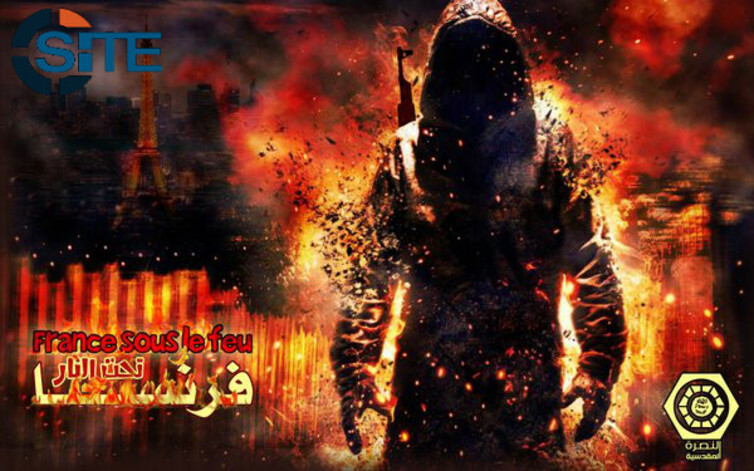 The pro-active media strategies of terrorist groups reach massive numbers of people. There is no chain of command and no membership roll—only a shared philosophy and a message to take action individually. This new trend of “sequestered action”, in which individuals act without direction from an organisation but as part of a general ideological movement, protects terrorists from detection and widens the net of their potential effect. It can be linked to an increase in terrorist attacks by one or two individuals working alone, such as the Boston Marathon bombings by two brothers in March 2013; the siege at the Lindt Café, Sydney by a single individual in December 2014; twin shootings in Paris at the Charlie Hebdo offices and a kosher market in Paris; and the twin shootings in Copenhagen at the central synagogue and Krudttønden café. 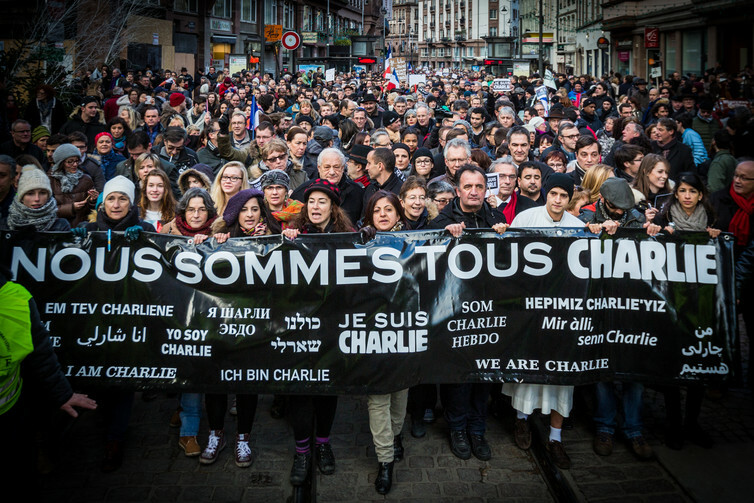 A protest against the Charlie Hebdo attack in Strasbourg on 11 January 2015. The critical point here is the shift from the elaborate plots that have previously characterised jihadism to independent action by individuals. While few people are willing to kill, many more would be willing to destroy a cultural monument. The centrality of visual images in the contemporary media environment provides new opportunities for, and increased impact from, the destruction of cultural icons, both locally and globally. As the gap between rich and poor grows, both internationally and within nations, there are increased numbers of people who feel disenfranchised. A percentage of these will wish to take some form of action. Firstly, we need to be more aware of the role that cultural icons play in conflict situations. Cultural genocide is inextricably linked to human genocide and ethnic cleansing. Attacks on a community’s history —- its cultural identity and the ancient monuments that bear witness to centuries of presence —- are calculated. Secondly, we should use networked media to diminish cultural myopia. A failure on the part of the West to seek understanding is exemplified in criticism of the sympathy that one quarter of Muslim people in Britain feel for the perpetrators of the Charlie Hebdo killings and in puzzled questioning about the 500 people who attended the funeral of Omar El-Hussein in Copenhagen. Dread Muslim: Walls are all you people care about. Eleanor Robson: I have several dear friends & colleagues in Mosul, worked with them for 25 years to help protect their cultural heritage. You? Dread Muslim: I have several brothers and sisters in Syria worked with them to save their future from dying. Saved many years of their life. Eleanor Robson: We’re not so different; I use my professional skills to support life & work of Iraqi friends who care about its past & future. Eleanor Robson: I agree that too many people care more about the past than the present but I’m not one of them. Dread Muslim: May Allah guide You. Please forgive me if what I said sounded rude to you. An emergent irony is that many sites of World Heritage significance are in the hands of people who do not adhere to the same notions of heritage. Consequently, a cultural crime inflicted in the West, such as an offensive caricature, can be met by a cultural crime in another part of the world, such as the destruction of ancient sculptures. Never before has the world has so much capacity to communicate, so much need to communicate and so little success in people understanding each other. We need to do better. We have the tools to do better. If we do not do better the destruction of ancient sculptures that are important to people in the west will become as commonplace as the destruction of human beings in the east. Interpretive signage may be a thing of the past in Adelaide thanks to a new interactive mobile app and website from History SA. Launched in early 2014, Adelaidia puts the history of Adelaide’s CBD at the fingertips of anyone with a computer or a smart phone. 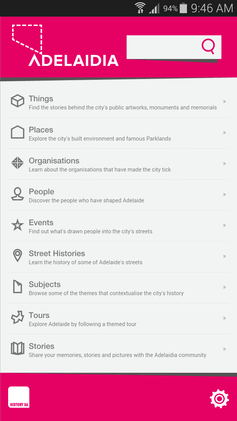 Adelaidia allows users to discover the history of people, places, events and organisations that have contributed to the story of Adelaide since European settlement. Users can access biographies uploaded by History SA and Adelaidia’s content partners. Adelaidia promotes the tangible heritage of Adelaide – that is, the things we can see and touch, such as buildings, places, objects, and so on. It also promotes the intangible heritage of the city – the things we cannot see or touch, such as cultural traditions, events and themes. The real strength of Adelaidia is the interactive features that allow users to contribute their own personal stories and experiences. From a cultural heritage preservation and research point-of-view, recording the experiences of individuals and groups is imperative; these stories give places and objects meaning. Unfortunately, because the stories are typically “siloed memories” rather than public histories, they are among the first sources of historical information to disappear. 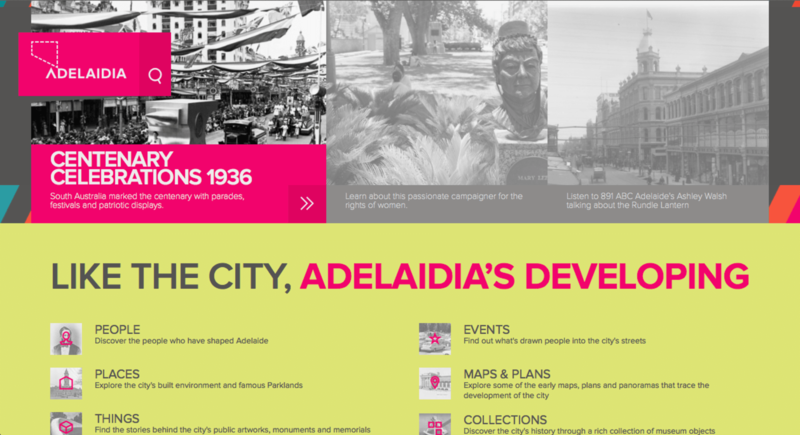 When accessing Adelaidia on both web and mobile platforms (and its South Australia-wide partner website, SA History Hub), users can choose a topic from the main menu: people, places, events, organisations. Selecting any one of these items will load a list of entries pertaining to the history of Adelaide. Each entry contains at least a biographical account and the option for users to view and upload media and personal stories relating to the entry. Adelaidia mobile app main menu. 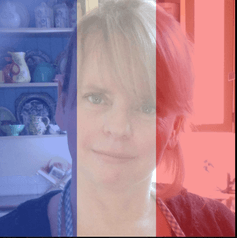 So far, not many users have contributed their oral histories – or in this case digital histories – to Adelaidia. As far as I can see from the “stories” option on the main menu, only two have been uploaded since the launch of the system. 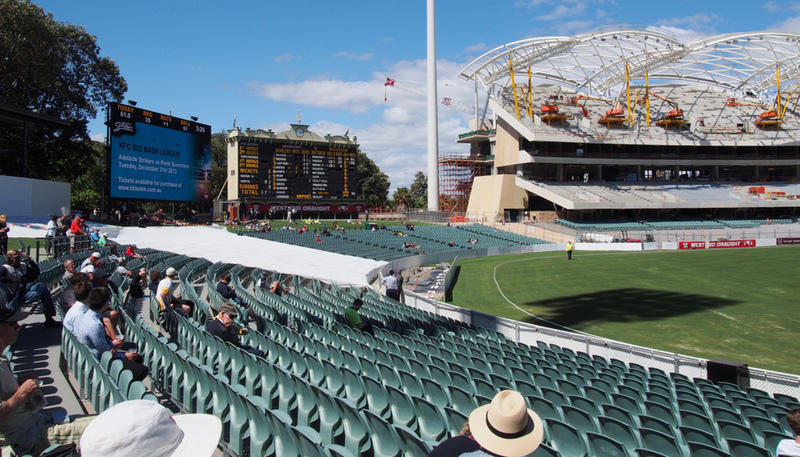 The lack of willingness to engage, on the part of the residents of Adelaide, might be for any combination of reasons. Among them, these might include simply not knowing that the option is there, people thinking that their story might be too mundane to contribute, that it might be perceived as too difficult. Or, of course, they may legitimately have nothing to write. One way for this issue to be rectified is for History SA to continue to upload its own content – and to form partnerships with additional content partners. That way, more entries will be submitted, including the noticeably absent Victoria Square and Adelaide Oval, allowing people to share their experiences about these places. Augmented reality in action. Adelaidia displaying direction and distance to Adelaide General Post Office from Victoria Square. For the most part, the mobile app is a “lite” version of the Adelaidia website; it contains basically the same content in a more streamlined design suitable for a handheld device. 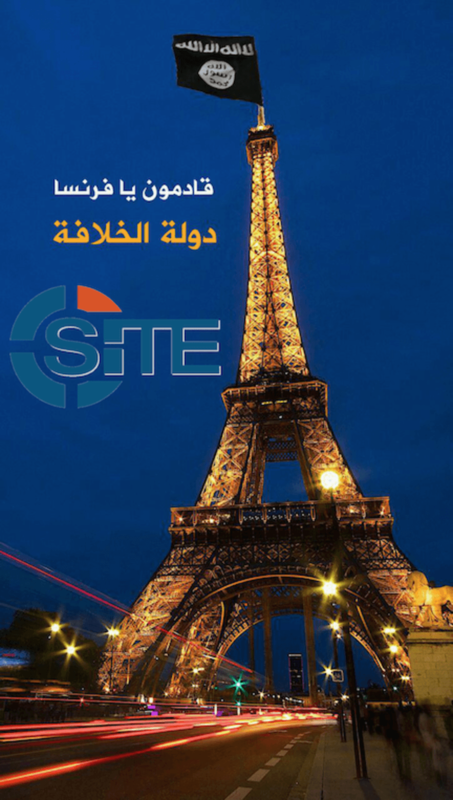 The app makes use of the smart phone’s in-built camera and GPS system for users to find out about places near to them and go on themed tours. When activated, the augmented reality view displays the direction and distance of entries featured in Adelaidia, overlayed on real-time images captured by the phone’s camera. Similarly, the map view uses the device’s GPS system to display a plan view of Adelaide’s CBD with Adelaidia entries marked by grey pinpoints. Clicking on the pinpoints in both views will load the biographical information of that entry. Screen shot of Adelaidia web site. When I road-tested the augmented-reality feature, the system clearly struggled to work in the CBD, supposedly due to interference caused by lack of satellite reception. This meant that, until I used it in the open space of Victoria Square, the direction and distance markers for most entries were inaccurate. This is a small bug in otherwise great software, especially considering this is meant to be a fun extra. On the other hand, the map feature works perfectly. One option for History SA to consider is to add a check-in feature that may boost the number of users who interact with the software. This could be done by adding the feature locally or by integrating a Swarm or Yelp check-in option. Adelaidia, along with the SA History Hub, brings interpretive signage into the 21st century. It has the potential to be a valuable, accessible resource to tourists, researchers and even those who are just looking for some entertainment. History SA has made a revolutionary step in preserving and celebrating the cultural heritage of Adelaide. For this software to reach its full potential, it must continue promoting the valuable user contribution features and engage with more experts to contribute content – especially regarding Adelaide’s Indigenous past. Following that, Adelaidia will mature from its infancy and help turn siloed memories into public histories. 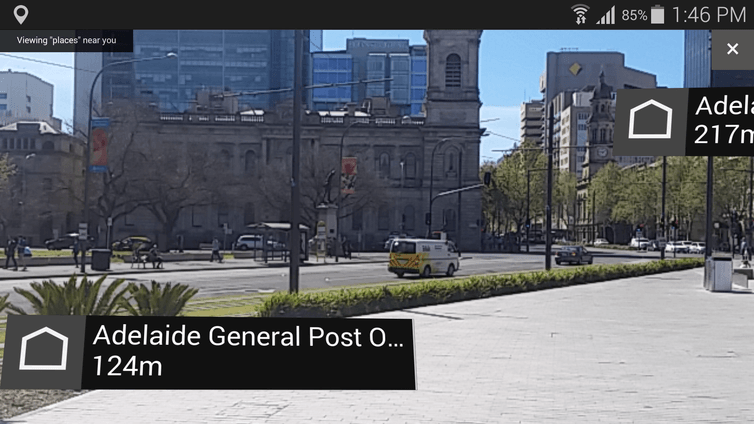 For this review the Adelaidia mobile app was accessed on both a Samsung Galaxy S5 with high accuracy GPS feature enabled and a Samsung Galaxy Tab 3 8.0, with the GPS feature enabled. Prime Minister Tony Abbott’s planned repeal of 9500 redundant regulations and 1000 Acts of Parliament could loosen dangerously close ties between politicians and developers. While such ties are problematic in many parts of Australia, the recent investigation of the Obeid family by NSW’s Independent Commission Against Corruption has brought this issue to the forefront. Research that I undertook when I was leading a 2011 bid for a Cooperative Research Centre in Heritage demonstrates that the nexus between politicians and developers in Australia has become perilously close. Over the last decade, red tape involved in the heritage approvals process has resulted in a dramatic increase in direct ministerial approvals for developments. In New South Wales, for example, the use of ministerial approvals for major projects or infrastructure rocketed from a total of nine during 2001-2005 to 457 in 2010. Forty-three were approved in the two weeks prior to the state government going into caretaker mode. Red tape is needed to reduce risk and to ensure transparent and equitable processes. However, too much red tape stifles investment. Moreover, frustrated developers seek greater use of ministerial “call in” powers to circumvent slow approvals. Australia’s current heritage approvals process is fragmented across jurisdictions, between agencies and between Indigenous and non-Indigenous heritage. This has produced mountains of uncoordinated, non-standardised data. This data is inaccessible, often redundant and usually incomplete. Decision-making power is dispersed across numerous agencies. Decisions depend on the interpretation and knowledge of individuals rather than on a solid evidence base. We need integrated data-sets that make it possible to determine what is common from what is rare or unique. Common approaches to data collection, storage and use should produce consistent decision-making. 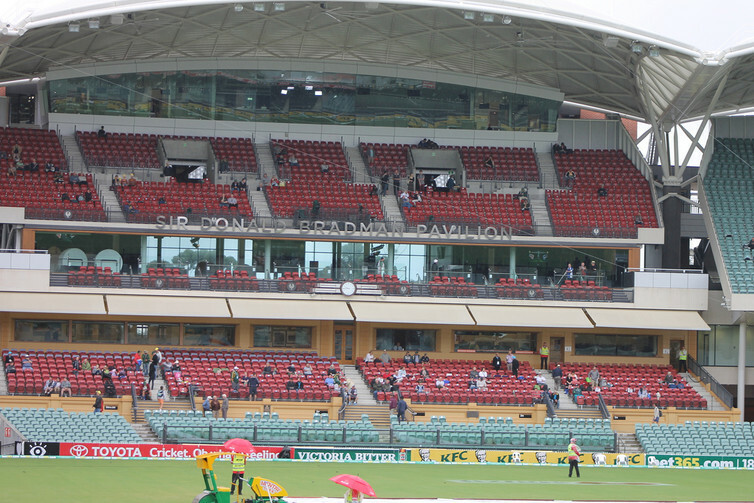 The escalation of ministerial approvals for major developments in NSW emerged in 2005. The Environmental Planning & Assessment Act 1979 was amended to include Part 3A for major projects of state and regional significance. Part 3A determined that the only planning approval required was that of the NSW planning minister. Each project had a spend in excess of $50 million. With Part 3A, both concept and project approval from the minister had statutory force. Part 3A projects circumvented local council approval and both state heritage acts. These projects did not need approvals under either the Heritage Act, 1977 or the National Parks and Wildlife Act, 1974. Moreover, Part 3A projects were protected from emergency protection orders and third party legal challenges under State environmental or planning statutes. While the aim of Part 3A was to provide up-front certainty for long-term or complex projects, this provision was abused. When the Liberal government came to power in NSW Part 3A was replaced by two separate assessment frameworks. One is for state significant development. The other is for state significant infrastructure. Importantly, the new system constrains the “call-in” powers of the Minister. It was anticipated that the number of applications designated as state significant would drop by half. Nevertheless, the level of ministerial approvals for major development projects is still way beyond what it was a decade ago. Throughout Australia fast-tracking major projects through ministerial approval has become a viable alternative to following due process. Occasional exemptions have become routine and the nexus between politicians and developers has grown murkier. A sustainable alternative to relying on ministerial approvals for large developments is to lessen delays in heritage approvals. Reducing red tape is one part of this. Developers need access to sound information. A standardised, integrated and coordinated information system would support sound decision-making. A comprehensive database would make it possible to assess if a cultural heritage place is unique, or one of thousands. Such a system would make it possible to classify and rank heritage assets. It would provide an evidence base for determining what can go and what needs protection. Uncertainty over heritage approvals is costing investment and jobs throughout Australia. In the resource sector, for example, The Fraser Institute’s annual Global Survey of Mining Companies consistently identifies uncertainty over the protection of wilderness, parks and archaeological sites as a strong deterrent to investment across Australia. There is an economic need for a streamlined information system that reduces the approvals delay and provides certainty for developers. Such certainty needs to be based on good, irrefutable data. In addition, decision-making should be informed by community values in order to pre-empt conflict and provide long-term confidence. Australia’s cultural heritage is recognised globally as unique. It includes the world’s oldest continuous cultural traditions, some of the first evidence for modern human behaviours and rich rock art complexes. In addition, it includes the histories of more than 200 migrant groups. This important heritage needs to be protected. However, we need to grow Australia’s economy and we can’t keep everything. Decisions have to be made about what we pass on to the next generation as heritage and what we let go. These decisions need to be transparent, fair and consistent. Reliance on ministerial approvals raises concerns about transparency and challenges the integrity of the system. It is possible that the current corruption cases in NSW are only the tip of the iceberg. A spate of internet hacking during the New Year period – including an attack on Skype by hacker group the Syrian Electronic Army, and another on social media photo sharing app Snapchat by website SnapchatDB – demonstrates the emergence of a new phase in hacking wars: corporate greed and hubris as the target, with a dose of social disruption. One such incident occurred on December 30, when hacker group DERP targeted games played by Twitch live streamer James Varga, who goes by the handle PhantomL0rd. DERP targeted PhantomL0rd, the most popular gamer streaming at that moment in time, so they could gain instant public exposure. In a display of technological prowess, they serially brought down the online servers of games that he was playing, including League of Legends, Battle.net, EA.Com and Disney’s Club Penguin. PhantomL0rd engaged in the play, acting as a conduit between the hackers and the gaming community. 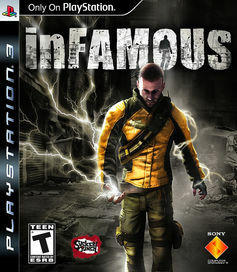 As he changed games he participated in a contest with the hackers, in a sense egging them on, while impacting hundreds of thousands of other players. He passed on questions from his audience about DERP’s intentions and capacity to shut down big companies such as Google and Facebook. 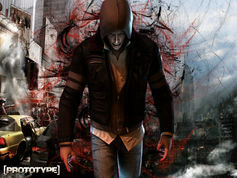 The reply from DERP indicated they wanted to frustrate “money-hungry” companies such as Electronic Arts (better known as EA Games). In a modern-day technological twist, the streaming audience became participants in a game within a game when the hackers challenged PhantomL0rd to win the multiplayer online Defense of the Ancients (DOTA 2) match he was playing at that time, or they would bring down the server. This was a win-win situation for the hackers and PhantomL0rd. 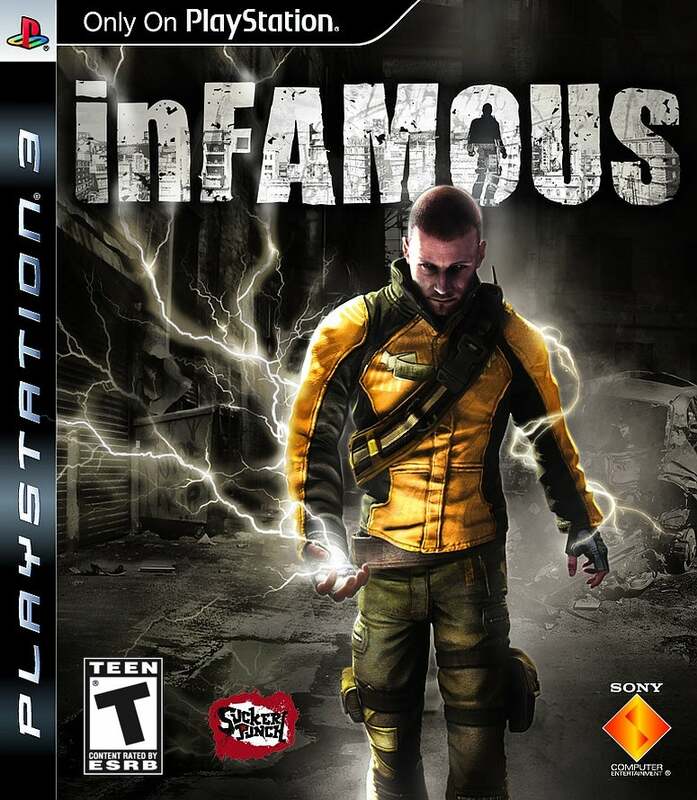 The hackers had direct access to an international audience and their presence grew this audience exponentially. 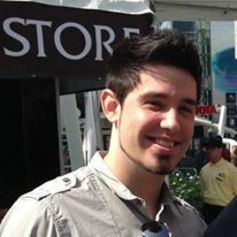 In three hours, PhantomL0rd’s personal stream increased from his usual numbers of between 5,000 to 15,000 viewers to a record 155,000 – the largest personal streaming audience recorded. For PhantomL0rd there was financial reward as well as recognition. As the audience grew, so did the US$4.99 monthly subscriptions for PhantomL0rd’s stream. Capitalising on the situation, PhantomL0rd turned on the subscriber-only mode, which meant that the only way to participate in the conversation via chat was to pay the subscription fee. This enraged someone in the audience, who retaliated by hacking and releasing PhantomL0rd’s personal information, leaving him vulnerable to payback from disgruntled would-be players. Both PhantomL0rd and DERP benefited through increased public exposure. According to the metric monitoring site SocialBlade PhantomL0rd’s followers increased by 50,000 since this event, and is now approaching 400,000. 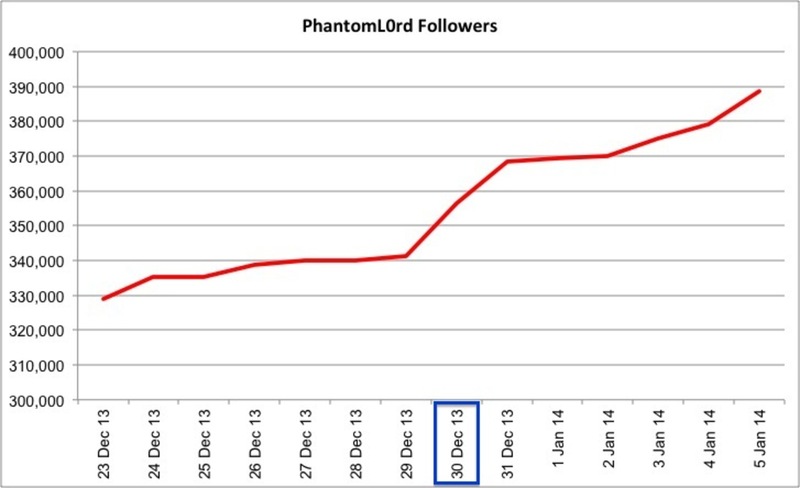 PhantomL0rd on the rise after Dec 30. In contrast, DERP is treated with more caution. Though some 450,000 people have watched PhantomL0rd’s video describing the hacking by DERP and his arrest by police, only 60,000 people follow DERP on Twitter. Clearly, the online community sees an element of danger in being linked to DERP or in attracting DERP’s attention. At the moment, groups such as DERP are simply demonstrating their power. In the process they are attracting new members with IT and hacking abilities and broadening their skills base. The question that arises is: what targets will attract the attention of these new, strengthened organisations?